How to decorate without breaking the bank (using thrift store finds, of course). Sometimes you can make the most elegant and easy Christmas centerpiece with things you already have and thrift store or auction items. I was using this white milk glass footed dish (I paid $4.99 at a thrift store)to hold keys and trinkets by my back door, but with Christmas fast approaching I decided to use it in a different way. I already had battery operated lights and vintage multi-color ornaments. I tossed them all together and wrapped some artificial garland around the bottom. This could be used on a dinner table, a coffee table, end table or a mantle. You are only limited by your imagination. If you are out thrifting and you spot something similar, you might think twice before passing it up. 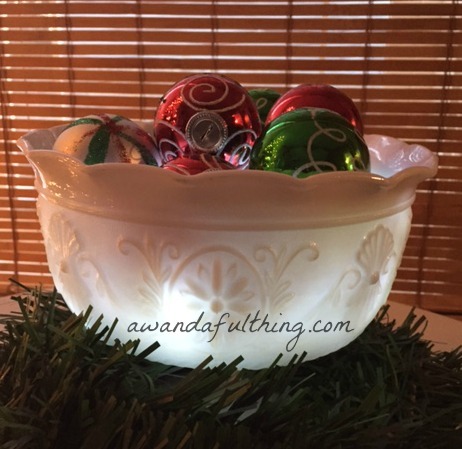 Day 6 – DIY Table Decoration – It’s A Wandaful Thing! 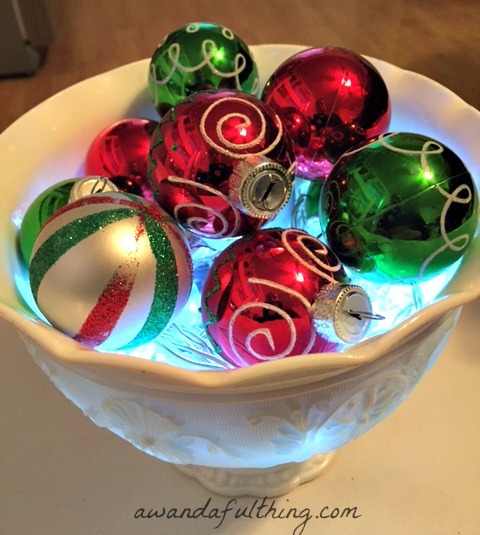 This entry was posted in Decorate, DIY and tagged Christmas, Crafts, creativity, Decorate, DIY, easy, ideas, inexpensive, living, ornaments, repurpose, reuse, simple, tablescape, thrift store. Bookmark the permalink. Pretty and easy. 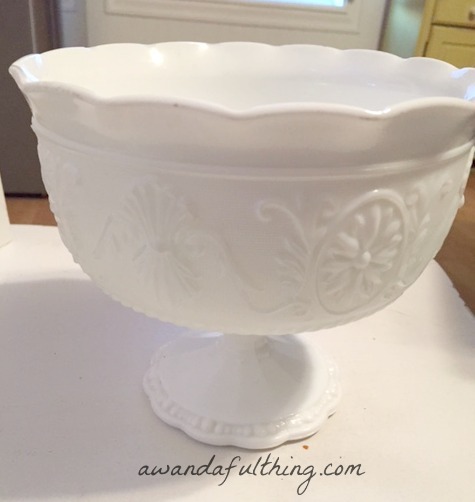 I have a small collection of milk glass – love the bowl.